Wild Berry Infusion has an exceptionally fruity taste. Its intense perfume takes you deep into the autumn woods. This refreshingly intense infusion is rich in certified organic dark fruits and blueberry. Delicious also when served cold, it makes the perfect hot drink for the autumn. Ingredients Hibiscus*, liquorice root* (Glycyrrhiza glabra), rose hip*, nettle*, pineapple*, natural flavourings, blueberry* (1%). Contains liquorice - people suffering from hypertension should avoid excessive consumption. For more information on product labels, please contact our Customer Service department. The information on the labels of the products may vary for reasons beyond our control, therefore, there may be discrepancies between the information on the site and that on the products delivered. Please always check the information on the product before consumption or use. 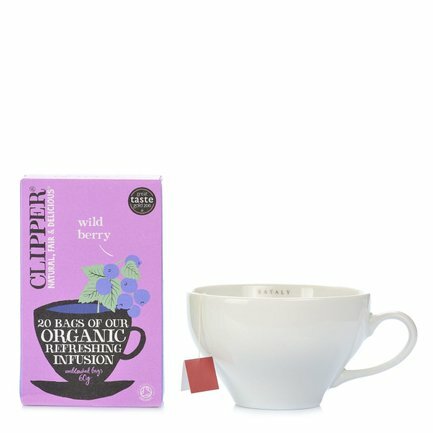 Clipper was born in Dorset in 1984, from its founders' passion for high quality teas. Today it is renowned across the world for its quality teas and infusions. Clipper was the United Kingdom's first Fairtrade tea company. Clipper teas and infusions are not just good, they are also produced ethically and sustainably.